Some of you might have already noticed one of the latest HYIP in DavidNews.com monitor. If not, in this review I will provide you a more detailed insight one of the latest rival to HYIP world. The program is called BtcClock joined Golden Stage listing on DavidNews 2 days ago and has been online already for more than 16 days. Have you already noticed something unusual about this program? If not, you will notice it in the next couple of minutes while reading this review. Therefore, let’s take a closer look and see what’s this program about and how it’s different from other programs. Often you see programs with Bitcoin logotypes placed on almost each page of the website, but in fact, they are not related to Bitcoin in a unique way. However, here we have a program called BtcClock, which accepts only one payment method. Make a guess… Yes, bitcoins. Moreover, this program has a comparably low minimal investment, which is just 0.005 BTC. Lately, most of the programs have minimum deposit $10. Such low investment minimum makes it more affordable for larger audiences. In the meanwhile, an income for deposit is being recalculated every 60 seconds. I see here a high addiction potential for dopamine junkies who like refreshing websites. Even though it was a joke, 60-second income updates are extremely frequent if comparing to standard once-a-day approach. Of course, it doesn’t mean that income % is much higher, but it might be interesting for some users to check how is the daily income changing during the day. Moreover, registered users might have already noticed another interactive element on the dashboard - any changes occurring on the account balance can be noticed by a sound, which reminds me very much of a casino. Especially, the combination of time count ticking seconds until the next accrual, profit calculated by minutes and these sounds. BtcClock is another HYIP with company data registered in the UK. In fact, the admin has chosen a company name Lucky Times Limited. Let’s see if they will turn out to be happy for people investing their bitcoins here. In the meanwhile, we can see that the admin has done the homework and registration data on the website is same as registration data on Companies House (company register online) website. Moreover, there is a UK phone number on the website! Though I didn’t try to reach BtcClock representatives. However, if you do so, please drop a message in the chat box, to let us know if there is anybody answering the calls. In terms of web design, I don’t see here anything unusual. In fact, I like the website. It’s not overloaded with too many visual elements and text, which makes me feel overwhelmed. Here we can see an example with most important information about the program placed right at the beginning of the home page. Of course, other content like company bio page and FAQ page is also available from the navigation. Another thing worth mentioning is that the website is fully responsive for mobile devices, which, of course, is must-do these days. 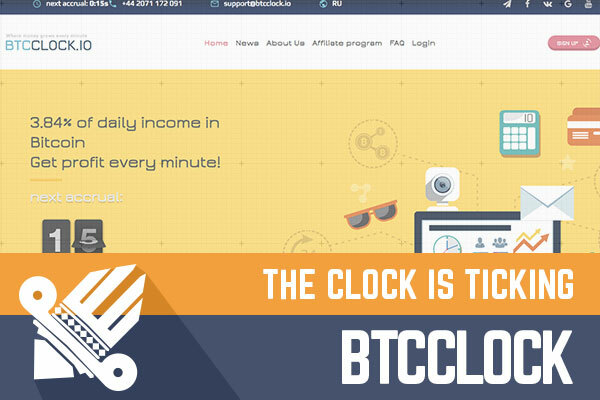 Not all website owners realize it, but again the BtcClock admin has nailed it. In the meanwhile, I have seen in the past many HYIP’s with great design quitting their business very soon. Therefore, it’s good that the admin has done the homework, but it has no impact on the performance of this program in the long run. I’m confused because there is only one plan offered by BtcClock. After seeing so many HYIP’s with confusing investment plans, different ways of calculating daily % and deposit terms, this seems like a kindergarten. As I wrote earlier, BtcClock is accepting deposits starting from as low as 0.005 BTC and there is no max limit (there is, but I don't think that anyone of us would invest that much). There is only one interest rate option, 3.84% a day. Even though moving numbers and sound effects look great, it’s important to understand a daily profit. Remember to do your own calculations, to understand how much can you earn daily. Just to give you a better understanding, here is a small calculation. For example, $50 investment in this HYIP will generate $1,92 a day. Most surprising, that initial deposit can be also withdrawn any time. However, keep in mind that there is a 5% fee for withdraw of the deposit. It seems fine to me, but the risk here is the possibility of coincidence when many people will decide to withdraw their deposits. Therefore, fingers crossed that the admin will always keep enough money in the program! There were quite a few unusual things about this HYIP, which make it different from many previous rivals. To sum up everything, the admin has thought well of making the HYIP interactive by adding function, which recalculates a profit each minute. The website itself is simple but functional. Nothing much to add to this program now. The program seems to be working, but we can’t predict when exactly it will go down. Therefore, please drop a message in the chat box in case you notice anything unusual about the program. In the meanwhile, always keep in mind that all HYIP’s are highly risky and you are the only person responsible for your investments. Therefore, if you ever decide to make any investments, don’t invest more than you can afford to lose! Investment plans: 3.84% daily for an unlimited time, possibility to withdraw your initial deposit anytime you want. YoBit allows you to claim FREE CRYPTO-COINS from over 100 distinct crypto-currencies, you complete a captcha once and claim as many as coins you need from the available offers. Have you ever consider maximizing your free satoshi claims with a BTC FAUCET ROTATOR?